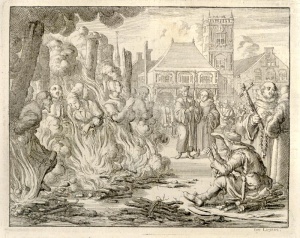 Lucas (Luckes) Michielsz was an Anabaptist martyr of Dordrecht, Dutch province of South Holland, by profession a glass-blower or a painter on glass, and burned at the stake with seven other martyrs on 20 March 1549 at Amsterdam. He had been baptized by Gillis van Aken. These martyrs are celebrated in the hymn "Tis nu schier al vervult ons broeders getal" (The number of our brethren is now nearly full), found in Veelderhande Liedekens of 1556 and later editions. Braght, Thieleman J. van. Het Bloedigh Tooneel of Martelaers Spiegel der Doops-gesinde of Weereloose Christenen, Die om 't getuygenis van Jesus haren Salighmaker geleden hebben ende gedood zijn van Christi tijd of tot desen tijd toe. Den Tweeden Druk. Amsterdam: Hieronymus Sweerts, 1685: Part II, 82, 84. Braght, Thieleman J. van. The Bloody Theatre or Martyrs' Mirror of the Defenseless Christians Who Baptized Only upon Confession of Faith and Who Suffered and Died for the Testimony of Jesus Their Saviour . . . to the Year A.D. 1660. Scottdale, PA: Herald Press, 1951: 483, 484. Available online at: http://www.homecomers.org/mirror/index.htm. Zijpp, Nanne van der. "Lucas Michielsz (d. 1549)." Global Anabaptist Mennonite Encyclopedia Online. 1957. Web. 22 Apr 2019. http://gameo.org/index.php?title=Lucas_Michielsz_(d._1549)&oldid=145837. Zijpp, Nanne van der. (1957). Lucas Michielsz (d. 1549). Global Anabaptist Mennonite Encyclopedia Online. Retrieved 22 April 2019, from http://gameo.org/index.php?title=Lucas_Michielsz_(d._1549)&oldid=145837.